Samsung states that QLED technology provides a larger color depth range, better wide viewing angle performance and higher brightness levels. 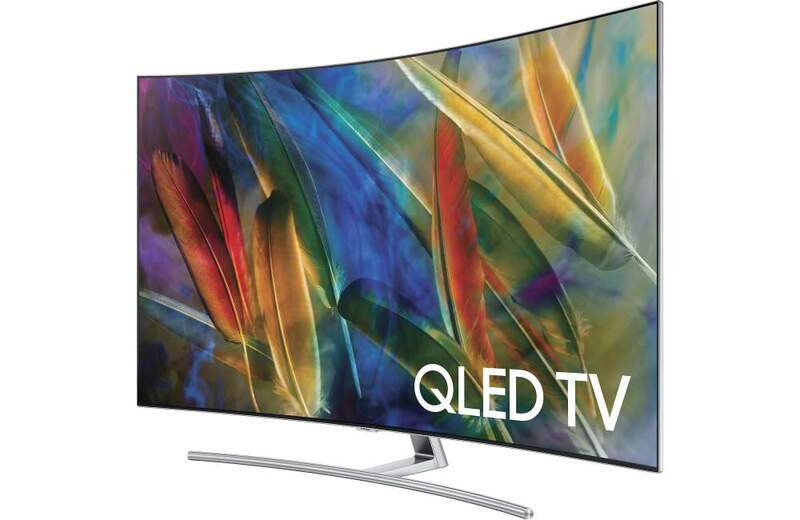 Furthermore, Samsung claims their new QLED TVs have a peak luminance range of 1500 to 2000 nits (brightness); however, I must point out that the Q7 models do not achieve this spec when viewing real (regular) TV content. With that said, the Q7’s still achieves good brightness levels, especially with HDR content. 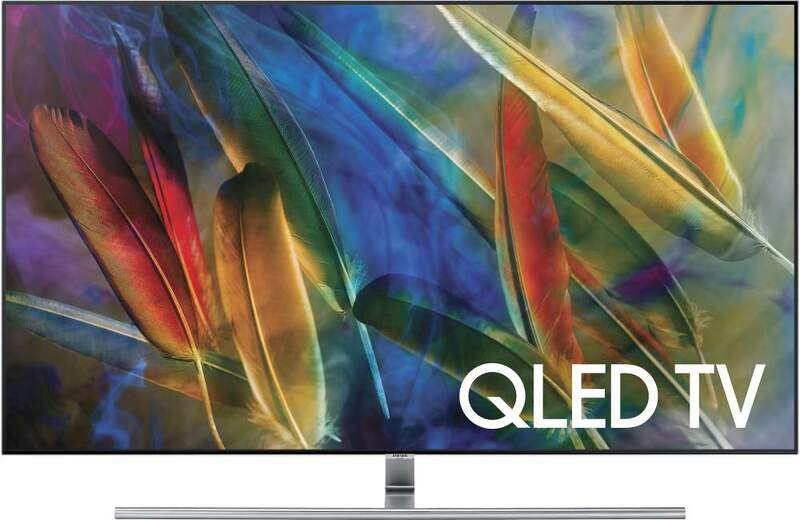 The Q7F is a flat panel model and is available in 55″ 65″ and 75″ screen sizes; while the Q7C is a curved panel option and is available in 55″ and 65″ versions. 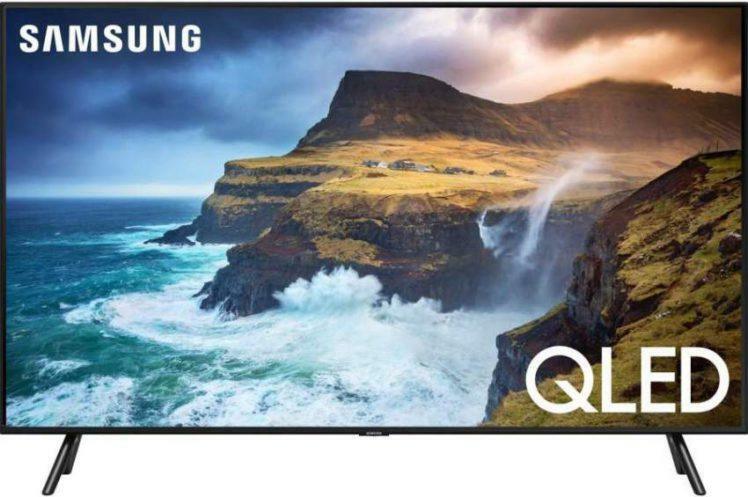 The Q7F and Q7C are virtually the same TV and contain the same features (with the exception of Auto Depth Enhancer on the Q7C) and do deliver the same performance as I discovered while doing a side-by-side hands on evaluation. The only true differences are in their respective designs: Q7F – flat screen, Q7C – curved screen, and stand type: Q7F – T-Type Real Stainless, Q7C – U-Type Real Stainless. 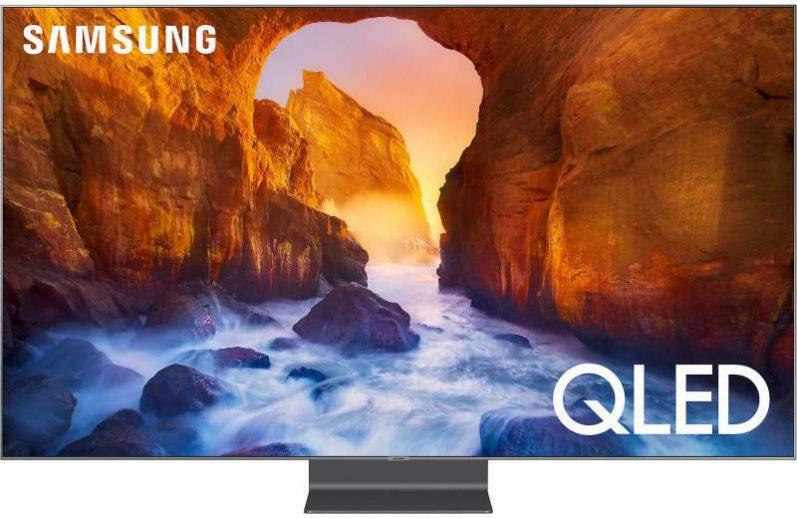 For more info on Samsung’s QLED TVs click here. Both displays are well built and feature a very thin bezel and a black boarder that surrounds the screen which is highlighted with a razor thin silver accent trim. Both screens contain a glossy finish and are illuminated with edge-lit LED backlighting. As mentioned above both models have attractive stainless steel stands that provide good stability for their large 65″ screen sizes. 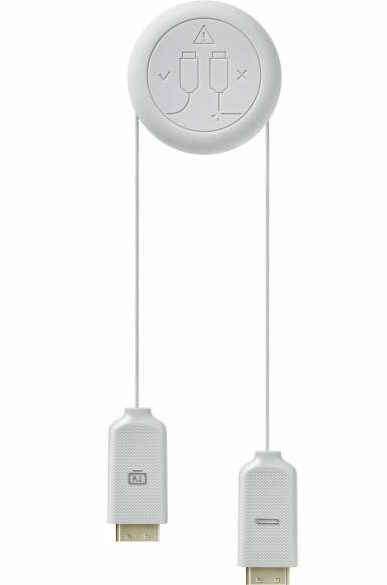 New smart remote control – OneRemote with built-in microphone for voice control. The remote will automatically detects and controls all connected devices and content with no manual programming required. However, compatible devices are required to use this feature. Note: There are no component or composite analog inputs available for this TV. I thoroughly enjoyed the overall picture quality of both Q7 displays. Image detail, clarity and transparency were excellent on these TVs and was what I expected from Samsung’s 4K premium models. Color performance was also great, thanks in part to the excellent wide color gamut on these displays, which achieves almost 100% of the DCI-P3 color space, which allowed for impressive color rendering on the Q7’s with 4K HDR content. Colors were rich and deeply saturated as well as being accurate and natural in appearance. Contrast range was great on the Q7’s and delivered plenty of dynamic punch which allowed for deep and dark black levels. This makes these TVs ideal for watching movies in dimly lit or dark rooms. Black screen uniformity performance was great on these TVs. I was not able to detect any light bleed coming from the corners or edges of the screens. Additionally, while viewing real content, I did not see any blooming around highlighted objects in dark scenes. I was a bit surprised that the curved screen of the Q7C did not show any screen uniformity issues (light bleed, clouding) or any image distortion, which can be a more common issue with curved screens. Motion handling was executed very well on both TVs, motion was very fluid during action scenes. However, if you do experience any motion judder while watching movies, set Auto Motion Plus to “Custom” and adjust sliders as necessary to eliminate or reduce judder. Otherwise, leave this feature off. Side angle viewing wasn’t all that bad on these displays, yet still suffered from colors appearing a bit washed out and images appearing dimmer when viewed from wide angles, which is typical for most LED TVs. 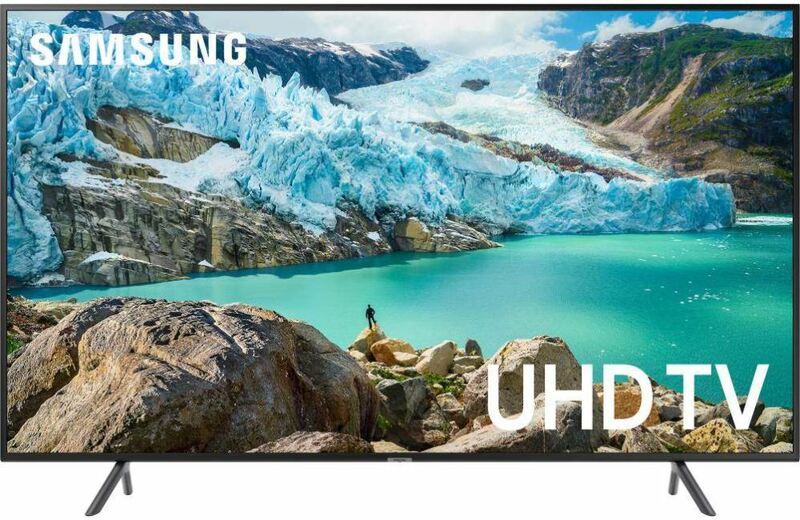 Samsungs Q7F and Q7C 4K HDR Ultra HD TVs deliver impressive image quality. The wide color gamut allows from excellent color reproduction with 4K HDR sources. Furthermore, color rendering is also very good with non-HDR sources as well. The strong contrast ratio produces very good peak white and black level performance for a very realistic and dynamic picture image on these displays. 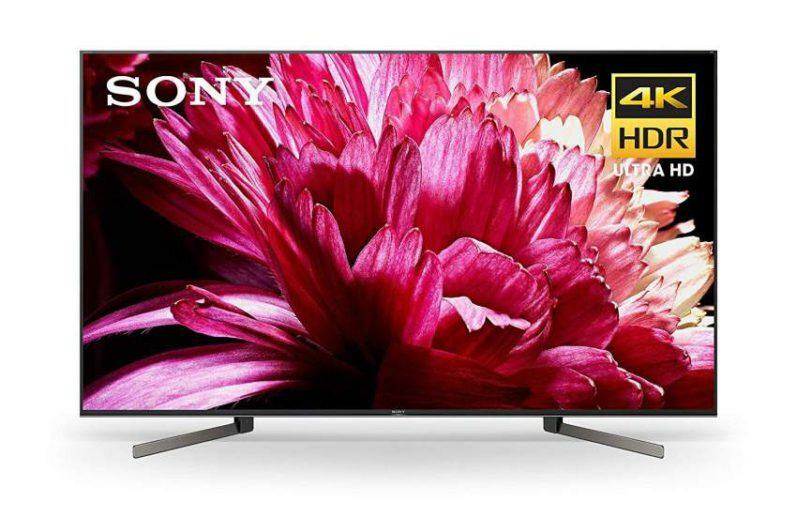 Add to the mix a excellent set of features including its smart TV platform, and you have two very well rounded performing TVs that get the job done. • With stand: 62.2 lbs. • Without stand: 53.6 lbs. • With stand: 62.4 lbs. • Without stand: 54.2 lbs.